The Responsorial Psalm on Sunday, the 5th Sunday of Easter, puts a song of praise on our lips. Praise is what we sing of, and praise is what we do. What we praise God for in the psalm, is that God is God, not just God for us. We pray in words that alert us afresh to the generosity and mercy of God for all, always. The evident meaning of ‘great assembly’ in the psalm is the liturgical assembly, be that in Temple, synagogue or Church. However, perhaps the still greater assembly is that of all of God’s children, even those who have never yet known the wonder and glory of God. Where do we see the goodness of God to ourselves? Where do we see his goodness for others? How might we share his goodness to us with others? 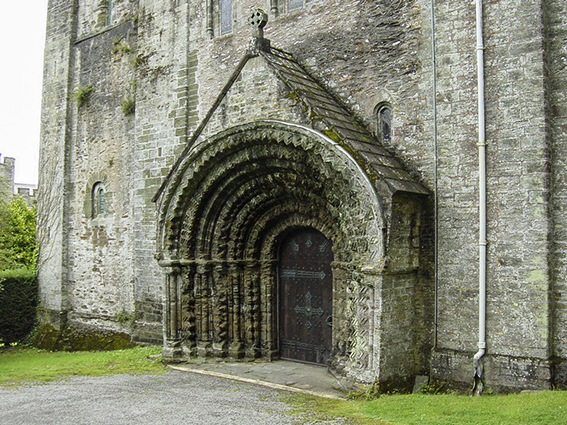 Photograph is of the great West Door of St German’s Priory, Cornwall. The door defines the threshold that we cross to receive great blessings, and cross again with great blessings to share. (c) 2004, Allen Morris. Speak Lord: Let us know our strengths and weaknesses. 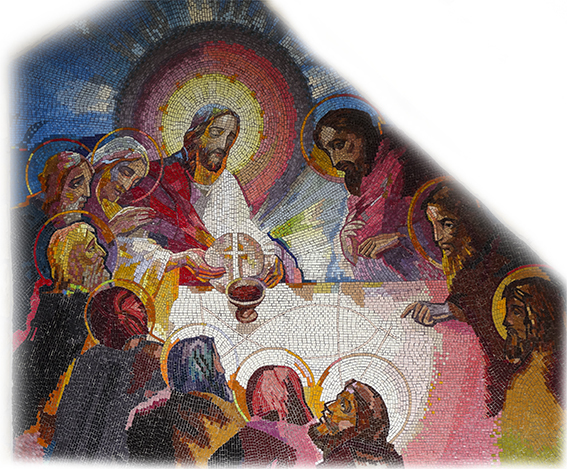 The first reading on Sunday, the 5th Sunday of Easter, gives a certain insight to the tensions that challenged the early Church. Saul had once persecuted the Church: now a Christian he faces death – yes, death – at the hand of other Christians. ‘Peace’ is only achieved by packing Saul off to modern day Turkey! In the absence of Paul, it is Peter who is the key figure in the ‘liberalisation’ of the Christian community, helping shed some of the customs and laws of Judaism, opening the Church directly to Gentiles. The ‘exile’ does not prevent the mission of Paul, maybe it even helps focus it and empower it. Maybe the absence of Paul opens up a space in the leadership that Peter rises to in a new way, and forces him to exercise the discernment proper to the leadership of the Church. Where has reversal helped you? Where has it hindered you? When has it been best to flee? Bring the fruits of your reflection to the Lord in prayer. Photograph of early Christian memorial plaque, Vatican Museum. (c) 2005, Allen Morris. There are five Easter Prefaces that can be used with the Eucharistic Prayers during the Eater season. Easter is certainly not just about Easter Eggs and Easter Bunnies! Nor is it ‘just’ about the rising of Jesus from the dead – or at least there is much more to the rising of Jesus from the dead than an event in the history of one man. The Resurrection is one might say a ‘game-changer’ or at least it reveals the nature of the game that is being played: the salvation of the world – of humankind and all creation. This is no matter of personal devotion or private religiosity. It is much more, and it is at our peril that we allow the Resurrection to be domesticated in our prayer, our worship, our theology. Where is the power of God’s salvation needed in your life? 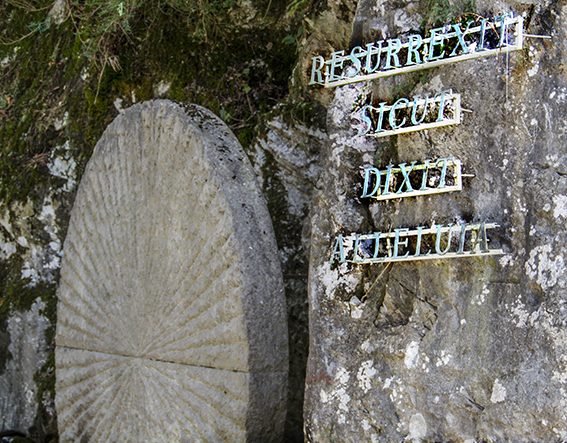 Photographs of the 15th Station, Lourdes. (c) 2012, Allen Morris. Taste and See: Made new, made better. The Psalm for the 4th Sunday of Easter had us sing of the goodness of the Lord, and of the way in which the rejected one becomes in fact the cornerstone of what is new and good and right. Often the point of growth for an individual or for a community is what seems the weaker part, or even the damaged part. From that different perspective can be found the way forward for all sorts of change and growth. Where has this been true in your experience? What ‘weakness’ or ‘disability’ might have potential for your future development, or that of your community? 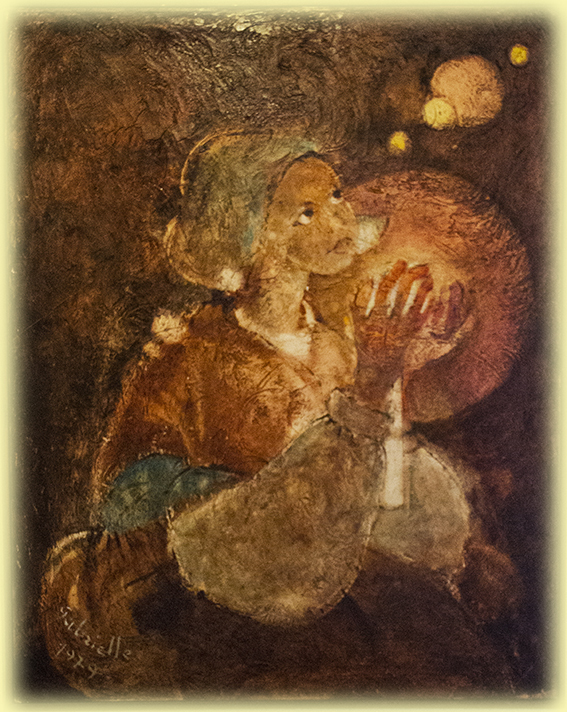 Painting of Bernadette Soubirous, Bolly Mill, Lourdes. Photograph (c) 2012, Allen Morris. The First reading at Mass, yesterday, the 4th Sunday of Easter came from the Acts of the Apostles. St Peter speaks to those who are scandalised by the love and compassion of God made manifest in the healing of a crippled man. How often our ability to see and know God and God’s actions by our preconceptions and self-interest. Where might that be a factor in your life now? Lord, that I might see. 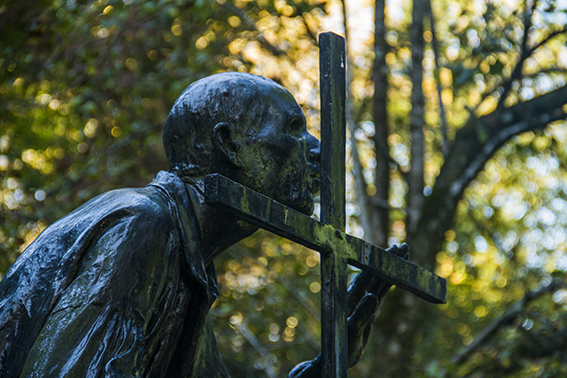 Statue in Lourdes. 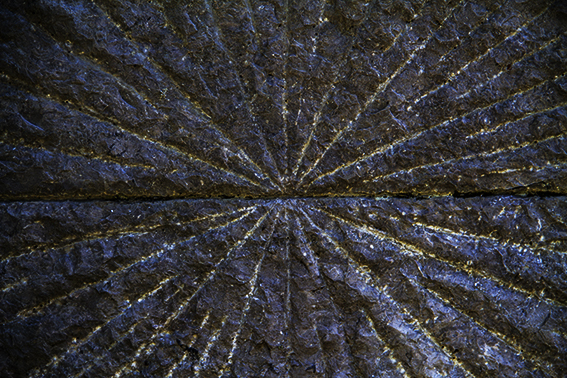 Photograph (c) 2012, Allen Morris. Speak Lord: Good Shepherd, speak. The Gospel for today, the 4th Sunday of Easter and Vocations Sunday, presents us with Jesus as the Good Shepherd. 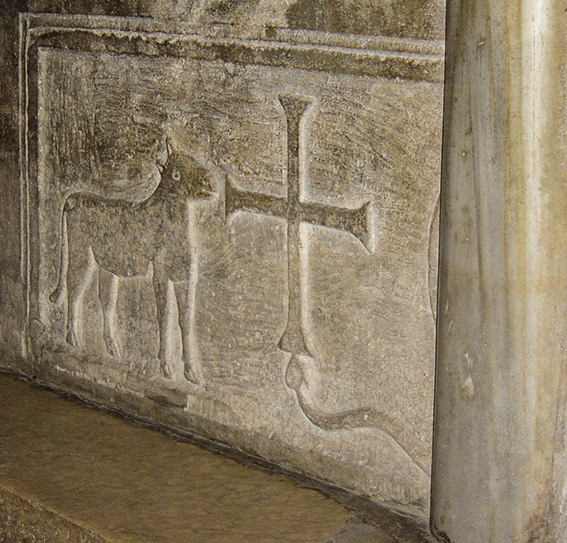 The photograph above shows a sheep, the Cross, and some part of a serpent. In that simple schematic carving is proposed the relationship between us, and the Lord, and the evil that besets us, leading us to sin and the Lord to die on the Cross. Yet his love frees us from sin for he vanquishes death and evil. It is his pleasure and joy to set us free, to save us. His pattern of service is one for us not only to be grateful for and admire, but also to imitate. We are able to make his way ours, not by our own strength, though we have to desire it, but by his strength shared with us in grace and especially in the Shepherd’s self-gift becoming for us the Lamb of God, giving his life for us in form of Bread and Wine. Photograph of Chancel Screen, Ravenna. (c) 2004, Allen Morris. The Second reading on Sunday, the fourth Sunday of Easter, comes from the 1st letter of St John. It calls us to be awake and alert to all God has done for us. As with most families what helps us to be who we are and to become who we are to become happens as we share in the family meals and the family stories. These can limit us and constrain us, or open our hearts, minds and lives to the newness that is available to us. At Mass are you closed down or opened up by what takes place? How can you better play your part in helping that sacrament of word and symbolic action more fully engage you and others, and help you to the newness and the dignity proper to the children of God? Photograph of station of Mystery of Institution of the Eucharist, Medjugorje. (c) 2015, Allen Morris.